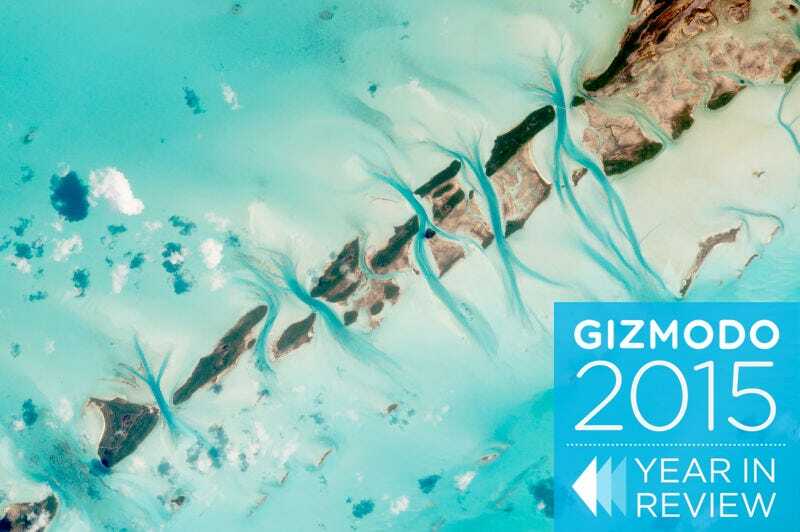 With astronauts becoming bonafide Instagram celebrities and new high-tech satellites blasting into orbit, it was a tremendous year for planetary imagery. From the Bahamas to the Sahara to the far side of the Moon, our Blue Marble never ceased to dazzle us. There was too much great Earth art this year to include it all, but here are a few highlights. 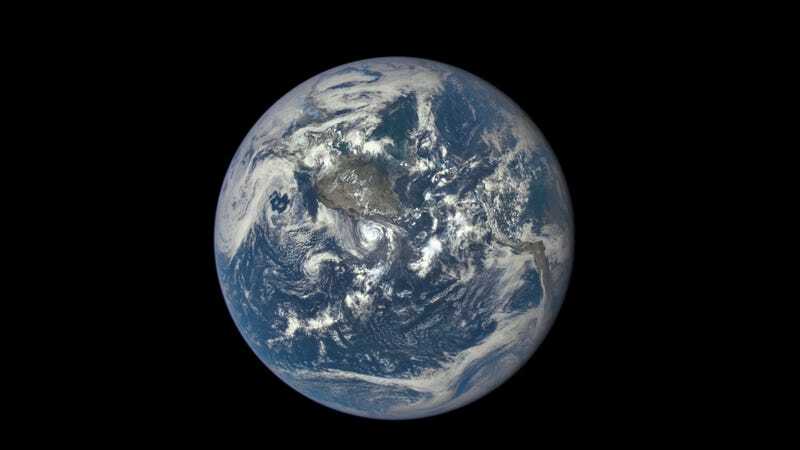 Our planet is a lovely sight to behold from the far side of the Moon, as NASA’s Lunar Reconnaissance Orbiter demonstrated earlier this month with a rare and ethereal view of the Blue Marble. As Gizmodo’s Mika McKinnon explains, the camera needed to roll on its side and stitch together raw, geometrically distorted black-and-white images before color data was added. This was a tough shot to produce, but well worth the effort. It’s really a shame that Greenland is turning into a swimming pool before our eyes, because those glaciers are freakin’ gorgeous. The unnamed berg pictured above was captured near North Star Bay in March, when the Sun is perennially low on the horizon, creating a starry sky awash in a gradient of color. The shifting seas of the Sahara are a lesson in geophysics, shaped by winds and erosion into massive structures over thousands of years. They’re also just beautiful. Prominent tidal channels incise these small island cays in a beautiful shot of the Bahamas captured from the ISS. The coolest part about this photo? If you look closely at the top of the turquoise-green channel in the upper right, you’ll see a thin string of white. That’d be the condensation trails of an aircraft, photographed from a space station moving 17,150 miles per hour 250 miles above the surface of the Earth. Wow. Gods and astronomy clashed on the summit of Mauna Kea this year, where researchers want to build a fourteenth observatory and the largest telescope in the Northern Hemisphere. Sacred in native Hawaiian cultures, Mauna Kea is the tallest mountain in the world from its underwater base to it peak, which rises 13,800 feet above sea level. Hawaiians share the mountain with a dozen world-class observatories, some of which are visible in this photo. Chile is no stranger to massive earthquakes, and the magnitude 8.3 that struck in September was among the largest of the century. This composite image shows how the Earth moved over the days following the quake, from the perspective of the Copernicus Sentinel-1A satellite. Bright yellow colors indicates the ground moving up to 1.4 meters into the sky. An impressionist painting? Nah, just trillions of tiny green algae bobbing along in the the North Atlantic, buoyed by eddy currents. Swirling convection systems bring up deep ocean nutrients, which feed the microorganisms busy converting sunlight into sugar all over the surface of the planet. It’s a beautiful confluence of physics and biology. Seriously, is this our planet or the opening scene from a fantasy adventure RPG? Sea level rise is already drowning coastlines across the world, and NASA’s shoreside spaceports are no exception. As we reported earlier this fall, the space agency is in the unique position of not only documenting sea level rise, but trying to figure out how to prevent the rising tides from swallowing its infrastructure—including the historic Kennedy Space Center located in the upper right of the image above. This gorgeous, true color image of the Red Sea bordering Saudi Arabia shows us some of the clearest waters in the world. Well, most of the time. Low rain and a lack of river discharge usually make the Red Sea the perfect place to go diving, but every now and then, extensive algae blooms will blanket everything in a reddish-brown muck. The desert in Iran comes alive in this photo, with shadows and sand creating a textured surface strangely reminiscent to that of tree bark. A splash of red brightens up the Patagonian steppe — perhaps a briny salt lake with the colors enhanced. This long shot of Japan, captured from 250 miles up, shows the profound impact technology is having on the face of our planet. It’s never truly dark anymore. Like fungal mycelia, nerve cells, and many other living structures, water takes the path of least resistance as it flows across landscapes. Perhaps it’s no surprise, then, that when dried up riverbeds in the desert country of Oman are viewed from space, they look an awful lot like a living organism. We saw some dazzling auroras in 2015, but this image of the planet literally aglow in shades of green, purple and pink takes the cake. Auroras happen when charged particles from space fall into our atmosphere, interacting with and energizing molecules like nitrogen and oxygen. They occur on other planets, too, in a variety of colors. “Is it teal, turquoise, blue-green, aqua or seafoam?” Scott Kelly can’t decide! The nordic island of Svalbard has a rep for being a barren, frigid wasteland, but in the summertime, coastal regions bloom with color thanks to ocean currents that bring warm water from the south. Still, you wouldn’t exactly call it balmy up there. Dried up riverbeds in southern Egypt were caught creeping across the desert like a giant slime mold. It was the summer of fire and drought and more drought and more fire for many parts of the world, including the Western United States. In June, so many fires were burning in Alaska and Canada that a trail of smoke wafted down across the Midwest and was visible from space. The active Chilean volcano of Villarrica exploded into life on March 3rd, blanketing the eastern flank of the snow-capped mountain with ash. Manicouagan Crater, Canada, is one of the largest impact craters on the planet, carved by an asteroid strike some 214 million years ago. The concentric structure visible in this false-color image hints at shockwaves generated by the impact, similar to what happens when a pebble is tossed in water. The Aral Sea, which lies on the border between Kazakhstan and Uzbekistan, is a case-study in human impacts on the environment. Colors along the water’s edge show how water levels have changed over time due to irrigation, but this multi-temporal radar image really looks like an abstract watercolor. It’s been a weird, freakishly warm winter on the East Coast so far this year. At least Wyoming is getting a snow day. Apparently a wee bit jealous of all the attention its big brother was getting this year, the Moon finally managed to photobomb the Earth. NASA’s Deep Space Climate Observatory caught the event from an unusual perspective and showed us the dark side of the Moon looking rather, well, bright.